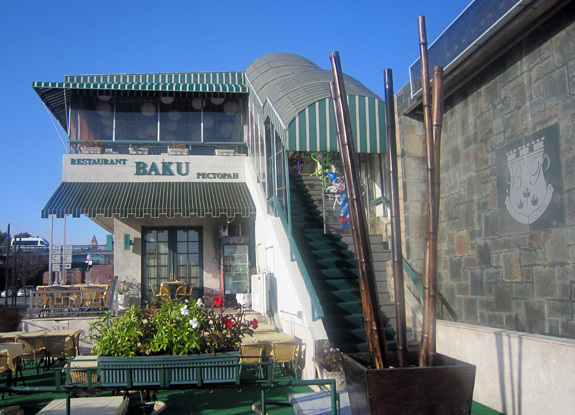 Baku Palace, in Sheepshead Bay, is one of the very few Azeri restaurants in New York. But if you imagine a hole-in-the-wall serving kebabs with an old Caucasian singer in the corner, you’re in for a surprise. With four restaurant rooms on two floors, the place is quite massive, and covers the better part of a block. It’s also more than a restaurant: like the other big floor show ventures in Brooklyn, it turns into a night club during weekends, and offers catering and private parties. 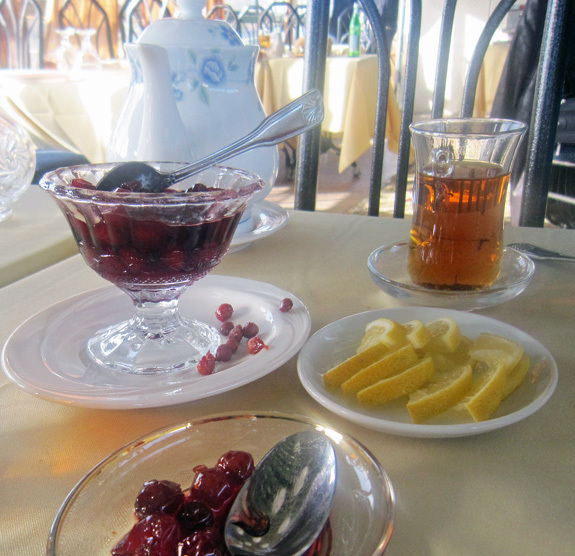 I’ve been to Baku Palace many times over the years, and this post is long overdue. In fact, I started the review just before Hurricane Sandy last year, and then had to wait until they reopened before I could pay them one more visit. I’ll let you admire photos of the rooms and private event on the restaurant’s web site. While you’re at it, check out the food pictures — the chefs seem to excel at the unfairly forgotten craft of watermelon carving. The menu is nearly as large as the place itself. I counted over 40 appetizers and 40 main courses, plus a handful of desserts. You’ll find a good though not exhaustive selection of Azeri dishes (e.g., no plov and no pepper dolma), plus the same oddities that populate most of Brighton Beach’s menus (such as the famous foie gras I’ll have to try someday, and no less than 22 fish dishes, a number of which certainly exceed the average Russian’s knowledge of the underwater kingdom), and somewhat creative signature dishes. The web site also features an impressive list of vodkas, but I’ve never been presented such a list during my visits, despite my repeated consumption of the beverage. Let’s get started. 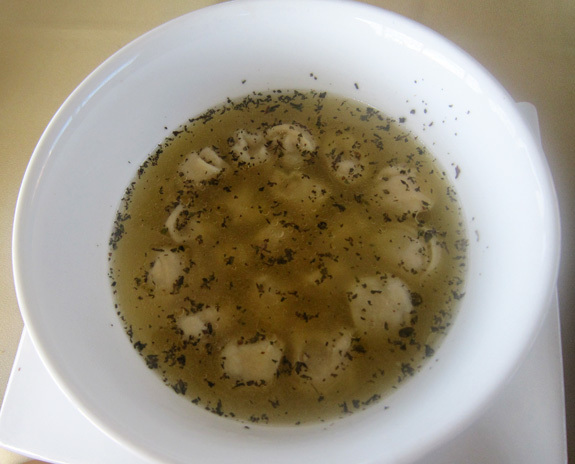 Kutabs are the perfect starters for any self-respecting eater of an Azeri meal. 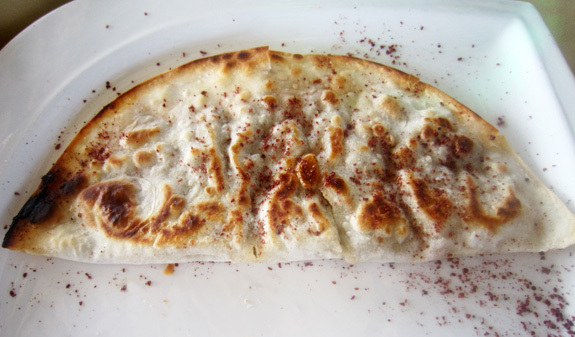 The meat kutab is classic, consisting of a thin, very tasty layer of ground lamb in pan-fried flatbread, sprinkled with sumac. 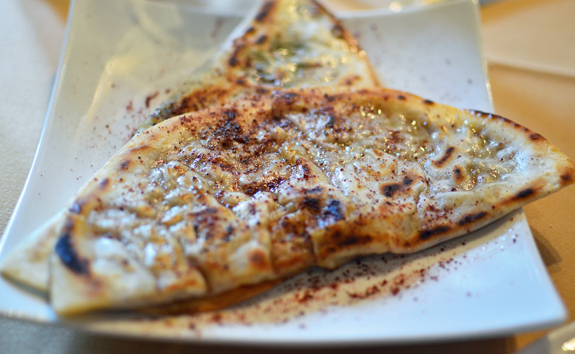 The spinach kutab was very good, too, and I don’t even like spinach that much. 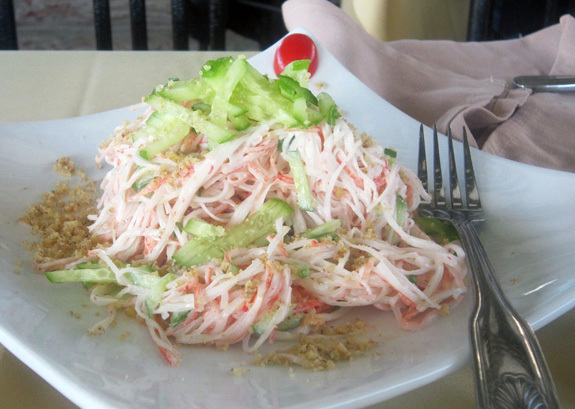 From the salad section of the menu, the crab salad for two sounded exciting. Unfortunately, there was about as much of the yummy crustacean in my plate as in the Caspian Sea. What we got instead was a big platter of surimi with cucumber, mayo, and walnuts. Referring back the description from the menu, I now realize that this wasn’t the only thing that went wrong with the dish: “crab salad: chopped tomatoes, cucumbers, greens, topped with fresh feta cheese and basturma, dressed with vinegar and olive oil”. It almost looks like we were served a different salad altogether — except I don’t see any mention anywhere of a “fake crab salad with julienned cucumbers, mayonnaise, walnuts, and 2 cherry tomatoes”! Lame. I’ll never know if the original recipe tasted better, but it certainly had more Caucasian touches. The assorted eggplant appetizer presented the vegetable prepared three ways: fried and topped with ground walnuts, rolled with cheese and mint, and as a spicy “caviar” mixture, all of them quite good, though lacking salt. Unlike the other two, the eggplant with walnut doesn’t appear anywhere else on the menu, which makes me wonder if it was another last minute substitution. The smoked fish platter came on no fewer than 3 plates, most likely because that’s how they were serving it to the private party sitting next to us that day. 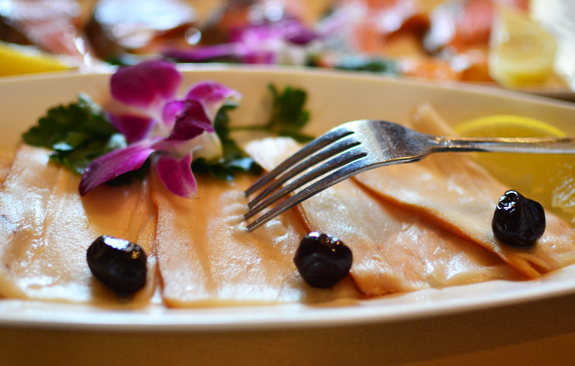 The cold-smoked sturgeon had a soft texture and pleasant taste. I don’t know if all the flowers that adorn the appetizer plates are actually edible, but they’re certainly unnecessary. If I remember correctly, at least the olives were good, which is rare in the neighborhood. 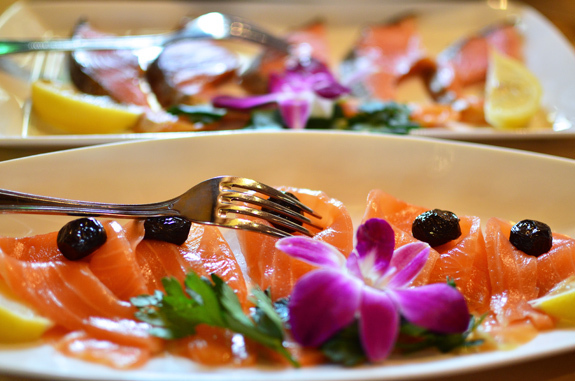 The two other plates both contained tender, not too salty, cold-smoked salmon, with the perfect amount of grease. The first one was sliced on a bias, the Western way, and the second one crosswise, in the Russian style (with lots of bones). Too bad the bread we asked for didn’t come until we were almost done. 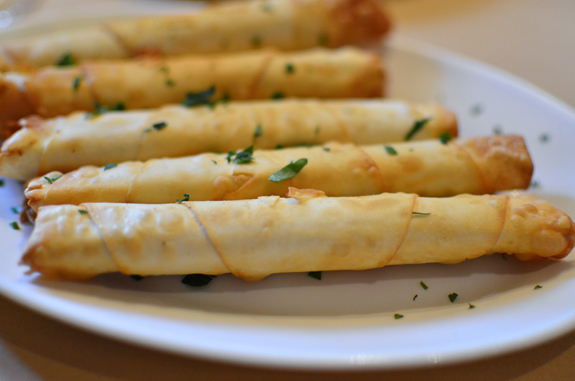 The cigars — cylinders of filo dough filled with some kind of farmers’ cheese (the menu said feta, but never mind) mixed with mint — partially replaced the bread. Not much to say about such a simple dish. Kebabs, the apotheosis of any Azeri meal, are offered in 12 different variations, and we tried the Baku meat kebab assortment. Lamb was in the spotlight, with pleasantly greasy ribs, a slightly too dry lyulya-kebab, and overcooked, somewhat dry lamb chunks. There were also very tender cubes of chicken that melted in your mouth, and nicely charred tomatoes and spicy peppers. The fries, however, were too salted and soggy. The coleslaw, made with cabbage, carrot, peppers, and cucumbers was passable. No comment about the canned peas. The restaurant also offered quail kebabs, although we might never know for sure that this is really what we got. 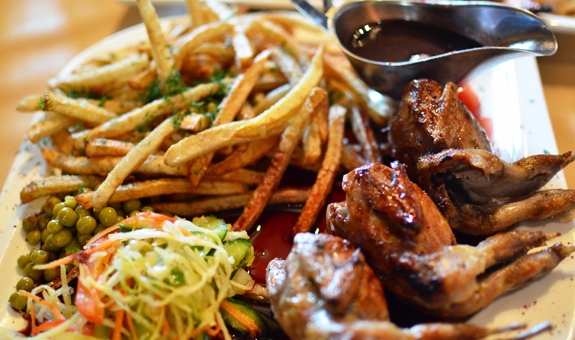 The clown who played maître d’ that day asked us twice if we didn’t want fried quails in pomegranate sauce instead, and this is kind of what the dish looked like — it certainly lacked “kebab flavor”. Plus, the tiny quails still had all their bones (folks, you can buy them semi-boneless if you don’t want to bone them yourselves!) and were a bit overcooked. They did go well with the narsharab. Same soggy fries, canned peas, and coleslaw as with the kebab assortment. The grilled fish platter was another must-try: after all, until Hurricane Sandy there was a big sign in front of the restaurant reading “Grilled Fish”! The salmon and sturgeon were a bit overcooked and therefore dry. On the other hand, the shrimp were good, and the bass was great — tender, moist, flaky. 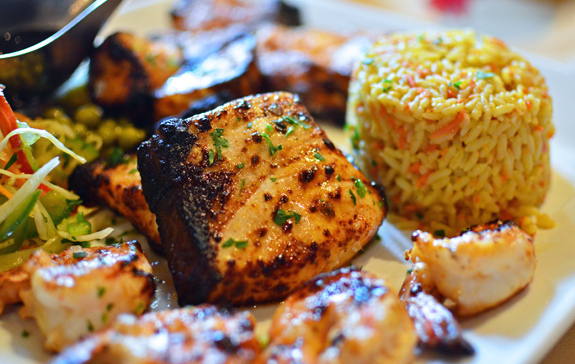 The glaze-marinade-stuff they use for the seafood is excellent and brings a delicious charred flavor. And the rice with carrots and coriander seeds was surprisingly good. 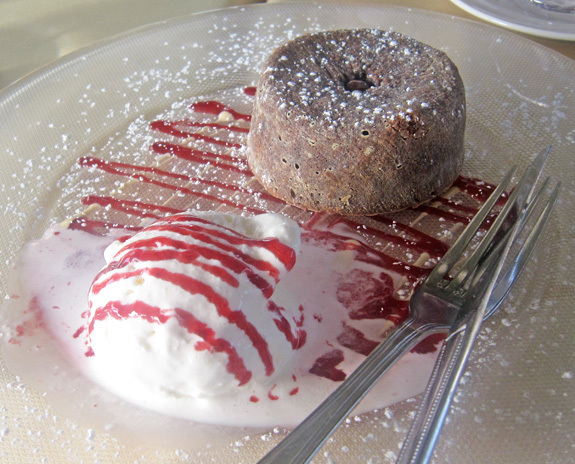 The dessert list looked as predictable as could be, but we were told that everything was homemade, and I do believe it. 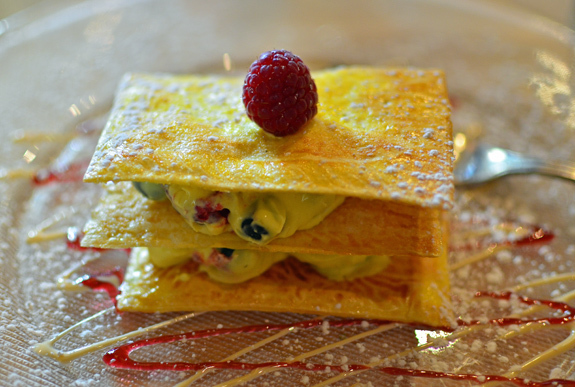 The French napoleon, Russian restaurants’ darling, consisted of filo dough encasing somewhat heavy pastry cream and mixed berries. The whole thing was fairly good. 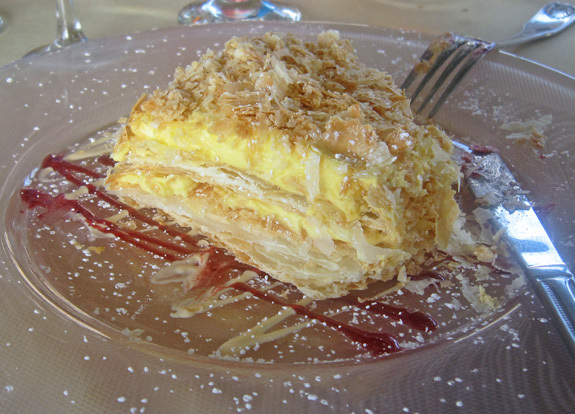 There’s another napoleon on the menu, a sort of Joe Schmoe version of the French one, made of something that felt like whipped cream, layered with filo dough. It didn’t have much taste. 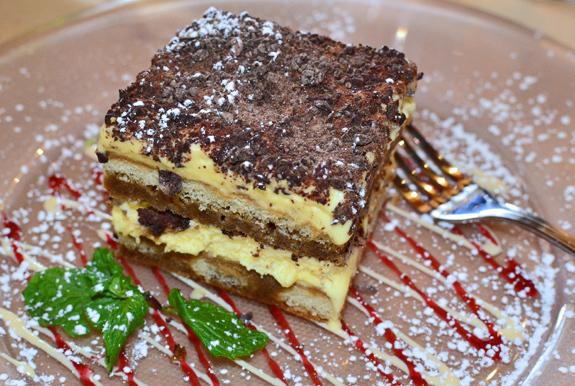 The tiramisu, another Brighton Beach obsession, wasn’t your usual recipe here. Ice cream (vanilla?) was sandwiched between layers of alcohol-laced yet slightly dry cake. It tasted fine, but this makes rather heavy finish for a meal. Finally, the tea is worth trying despite the sticker price: along with a pot of good black tea, we got some excellent sour cherry preserves. The only thing missing was pakhlava — it beats napoleons any day. There’s a lot to like about Baku Palace. 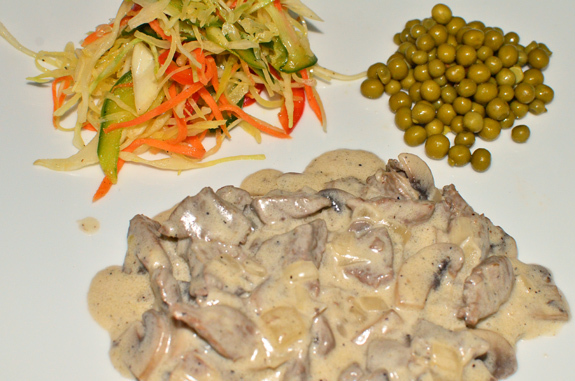 You can eat outdoors with a view of the bay, or enjoy some Saturday Night Fever à la Russe. 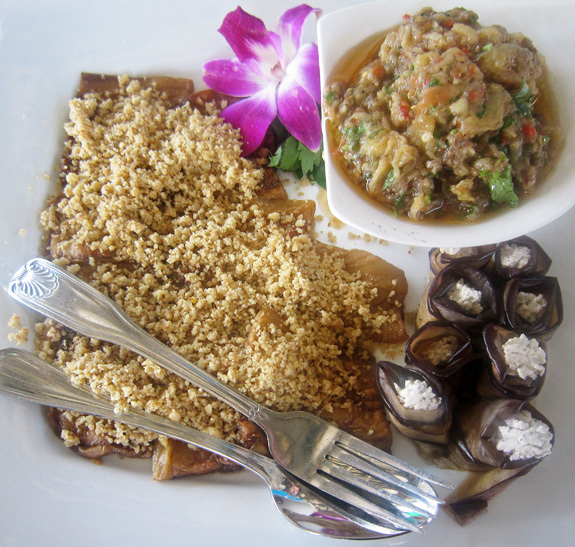 Certain dishes, like the kutabs, are notably addictive. 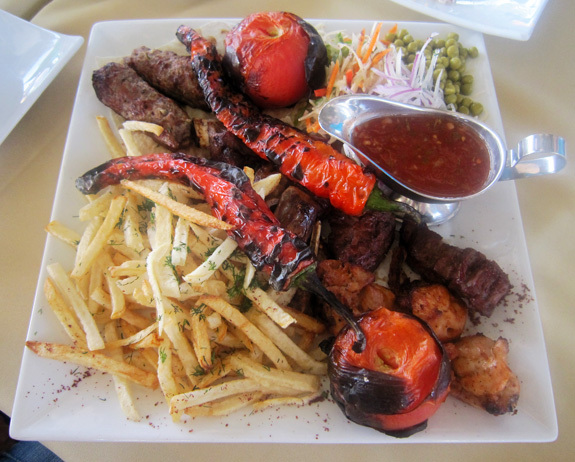 The kebabs can be quite good when they’re not overcooked, and some of the appetizers aren’t bad either. I even spotted a bottle of decent Georgian orange wine on a nearby table (more on Georgian orange wine in a future post, maybe). Then there are the problematic things. In my memories, dinner service is fine. But what I experienced during my lunch visits for this review, however, makes me wonder if management doesn’t recruit the daytime waiters straight from Baku’s circus. Some of the kitchen staff, too. If you’ve run out of dish, just say so! Don’t try to make up your own new version at the last minute. If I wanted to eat a meal made with whatever’s left in the fridge and served with a side of canned peas, I would have stayed home! This fad for canned peas has to stop, seriously! The ridiculously long menu doesn’t help either, and for each dish that’s properly executed, you can probably find two that are just so-so or mediocre. Wouldn’t it make sense to keep only a third of the dishes on the menu, and offer the rest for private events only?